Indian culture is one of the most ancient and diverse cultures of the world. Indian Cultural entities have been one of the strongest, deepest, most profoundly felt on Earth. All through these centuries for over 5000 years, India's culture heritage has been enriched by the waves of migrations and invasions which were absorbed easily into the essence of Indian culture. Music is a universal language which transcends all barriers of country, race or religion. It unites man to man, but even more, it unites man to God. Music, it is said, is the language of the soul. Indian music is said to be rooted in the Vedas. It is believed that God himself is musical sound, the sound which pervades the whole universe, i.e. Nada Brahma. Divine, as is Indian Music, the musician has to cultivate a sense of abandonment, in order to fuse with the Supreme reality -Nada Brahma. Indian Classical music derives its essence, not so much from its structure and rules, as from the quest and goal- God. Said to originate from Samaveda, initially only three Swaras were evolved and used for musical recitation of the chants of the same. The number of Swaras rose from three to five and then to seven. Five of these seven swaras were subdivided into Komal and tivra variations. The spectrum, thus finally evolved, covered a gamut of twelve swaras. This scale of twelve swaras, recognized by Indian Music, also forms the basis of all styles and forms of music all over the world. It took a long time for music to come to the present form. Major advances in music were made between 14 th and 18 th centuries. On account of various invasions during the period, Indian music came in contact with the Persian Music and led to the development of two forms of Indian Classical Music, Hindustani & Carnatic. . The Carnatic and the Hindustani music have some features in common as their heritage and philosophy is essentially the same. However their ragas and their articulation are usually distinctive. This form of music is predominantly present in the Northern Part of India. The roots of Hindustani Music is traced to the emergence of Dhrupad & Dhamar. It further developed into Vocal & Instrumental Streams. 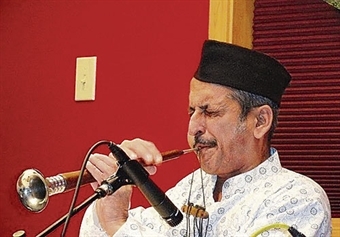 Further emergence of Khayal from Dhrupad as a result of influence of the Mughal Kingdom, Classical Music underwent a change in character , moving from Temples to the Courts. Names like Miyan Tansen have been one of the greatest influence on the Hindustani Style. Love, humor, pathos, anger, heroism, terror, disgust, wonder and serenity are the nava rasas or nine basic emotions which are fundamental to all Indian aesthetics Hindustani or Carnatic. Various styles of singing in the North Indian Style are Dhrupad, Khayal, Thumri, Tarana and Tappa. Various styles of singing in the North Indian Style are Dhrupad, Khayal, Thumri, Tarana and Tappa. The most ancient form. "Dhruva" means fixed & "Pada" means text. There are no decorative touches in Dhrupad and only the Meends and gamaks are allowed. No 'Taans' in Dhrupad, only Layakaris like Dogoon, teengoon, Adi etc. The lyrics are based on religious offerings and Pakhawaj is the percussion Instrument for Dhrupad. In India the name of Dagar family is synonymous with that of Dhrupad. The most popular form of singing at present, 'Khayal' , an urdu word means imagination. Less rigid than Dhrupad and more romantic & delicate, it allows for greater decorative effects and freedom. A Form of light Classical Music, developed during the later part of the Mughal rule, Thumri allows for extreme flexibility and freedom. Generally recited with a liberal use of meends and taans, the basic character and nature of Thumri is very romantic and allows for the expression of varying emotions and feelings in its rendition. The essence of Thumri can be best understood from the name itself 'Thumri' derived from 'Thumak' meaning graceful stamping of the foot. Like khayal, tarana has sthayi & antara but difference lies that it uses syllables like nadir, tanana, yalali etc. Today generally, the rendition of Tarana is done only after Khayal by an artists to display prowess in taans in drut laya or fast tempo. Also a form of light Classical Music, it originates from Punjab and is richly ornamental, with quick turn of phrases and incessant volleys of Taans emerging from each word, in a swinging rhythm. Sung in Punjabi Language, the origin of this style is credited to Miyan Shourie who originally belonged to Lucknow but later migrated to Punjab. The songs are love-lyrics.